The Stein Divide – we finally made it! A sunny weekend in August and the Coast Mountains can be busy. For the second time (the last about three years ago) we thought we’d try camping at Hanging Lake near Whistler. We also made an attempt to scramble up Rainbow Mountain. 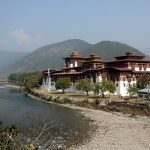 I was fortunate enough to be asked to join a one week mission to Bhutan related to climate change resilience planning. I managed to explore Thimphu, take the Dorchula Pass over to Punakha, and to hike up to the famous Paro Takseng (Tiger’s Nest Monastery! What a great experience. 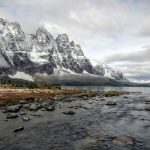 Tonquin Valley – snow and mud! Perhaps this was one backpack trip too many for 2016. 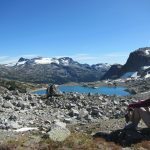 We knew we were leaving Calgary to go back to Vancouver in 2017, and wanted to hike this spectacular u-shaped hike through the Tonquin Valley. 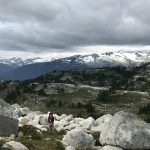 We had all types of weather on this hike, including snow and sleet as we made out way through the valley – some great views, and spectacularly muddy trails.